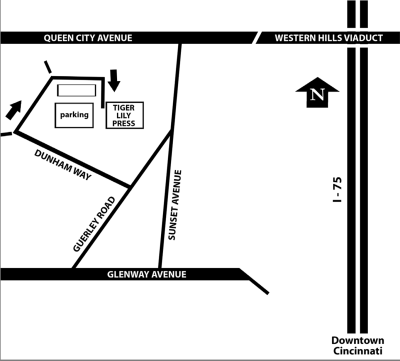 Tiger Lily Press is located on the grounds of Dunham Recreation Center, 4356 Dunham Lane, Cincinnati, OH. When Google states that you have arrived you may have a few more feet to go. Please reference the black and white map to get you to Tiger Lily Press. We are excited to hear from you! Please inquire by filling out the form and we will be in touch with you shortly.